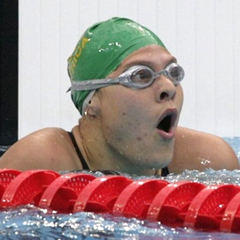 Cape Town - South Africa's Natalie du Toit qualified fastest for the final of the women's 200m individual medley SM9 at the London Paralympics on Thursday. Swimming in Heat 2, Du Toit touched the wall in a time of 2:36.92 - well ahead of second-quickest qualifier, Britain's Stephanie Millward (2:38.47). Du Toit's compatriot, Emily Gray, recorded the 11th and slowest time in the heats (2:54.03) and failed to make Thursday evening's final. The final is scheduled to start at 18:38 SA time.